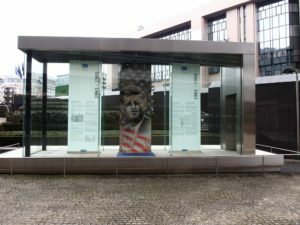  The House of European History in Brussels, launched by the European Parliament, opened its doors to the public in 2017. It is housed in the Eastman Building, a former dental clinic sponsored by Kodak founder George Eastman, built in 1935 at Parc Léopold. The park, which was planned in the mid-19th century, was originally intended to be a zoological garden, but the project was never realized. Instead, the park became home to a series of villa-like buildings, some of which housed scientific facilities. On the edge of the park are the buildings of the European Parliament. Only a few steps further you will come across the buildings of the European Commission, the Council of Ministers and the European Council. In the name of these buildings, which form the Quaritier Européen, you can see quite a sense. 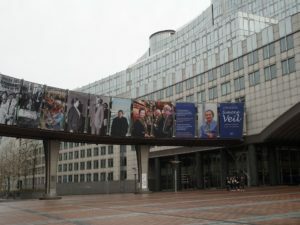 The building of the Commission is named Berlaymont, which can be traced back to the monastery founded in the early 17th century (Couvent des Dames de Berlaymont). If one is good-natured, it is said that monasteries have been an important element of European culture for centuries, and even drivers of innovation, and wishes the Commission to benefit from the genius loci. If one is less good-natured, one compares the Commission with an outwardly secretive community, which cultivated little asceticism within the confines of a monastery. The building is based on a modified cross layout and one cannot help noticing this accumulation of religious references. The building of the Council of Ministers is named after the humanist and Neostoicist Justus Lipsius. 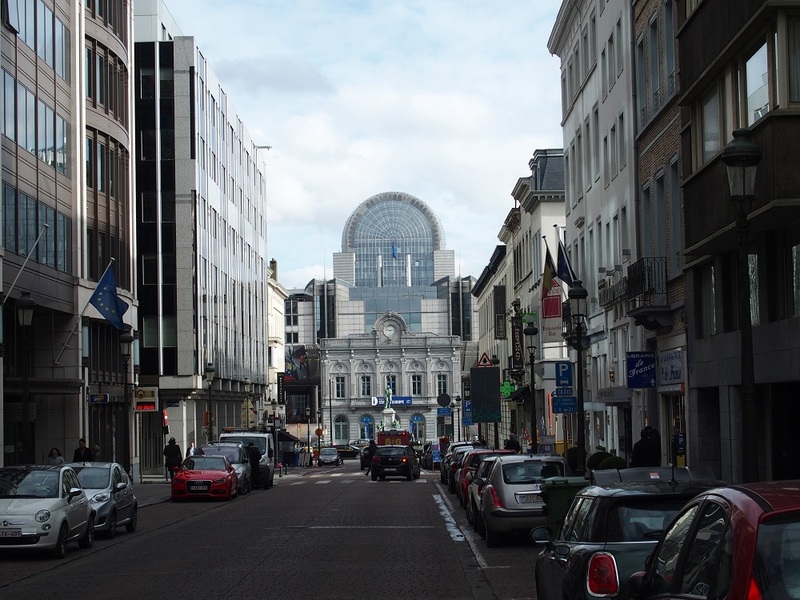 The new House of the European Council, built next to it, rises to a certain extent from the Résidence Palace, an apartment building raised in the 1920s for a well-filled purse. The European Parliament has named its buildings for convinced Europeans and Democrats: Altiero Spinelli, Paul-Henri Spaak and Willy Brandt. In the square above the Luxembourg station, plastic photo-sheets, at a height of several meters, can be used for temporary exhibitions. In March 2018, the life cycle of Simone Veil will be presented, which in 1979 was elected President of the European Parliament, first elected directly by the citizens. She had survived the Holocaust and was one of the most important French women’s rights activists. She died in 2017. 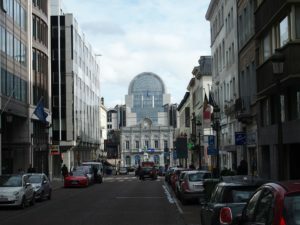 Much more can be said about the topography of the European quarter in Brussels, but even the few references to names and symbolisms suffice to show that the district itself brings together the most diverse aspects of European history and thus makes a very meaningful neighborhood for the House of European History accounts. The HEH shows a permanent exhibition on 5 levels and on two further a temporary exhibition. At the moment (March 2018) the first temporary exhibition on „Interactions“ is still running. 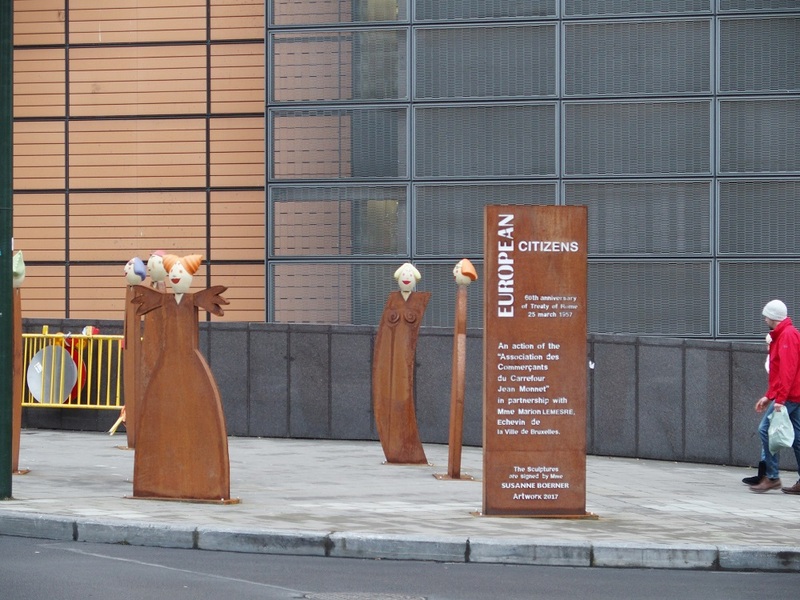 The entry objects of the permanent exhibition include representations of the Myth of Europe and e.g. a Boeotian bowl from about 420 BC with the Greek alphabet. 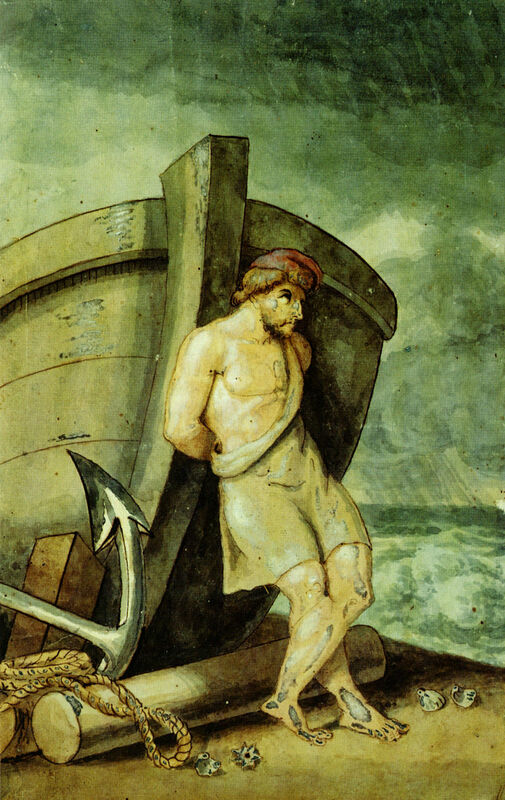 Overall, however, the focus is on the modern era since the French Revolution. The structure of the exhibition is chronological and follows the epochal division, which to most visitors from the history lessons in the school may be known (epoch of the French Revolution, industrialization, Revolution 1848, colonialism, world wars, National Socialism, Stalinism, Holocaust, Cold War, Economic recovery after the Second World War, European integration and much more). Apart from a printed exhibition guide, the exhibition is designed to pick up a tablet and choose one of the 24 official languages of the EU to listen to introductions and, e. g. to read descriptions of the exhibited objects. Each object can be tapped on the tablet. In addition to static objects, there are films, video documents, showcases, freestanding objects, citation tapes, tables, etc. In the rooms themselves, one moves along gentle curves, goes through straight lines or has to circle a corner. Sometimes it is quiet, sometimes there are intentional noises. Diversity is an important theme throughout the exhibition, diversity is a subtext of European history, and so exhibition design also takes up the issue of diversity. The history of violence in Europe, both inside and outside, in the colonies, for example, takes up a lot of space. The exhibition does not gloss over the story. Nor does it impose a master narrative. The epochal structure is also structured by recurring themes: diversity, memory, the road to democracy, the role of emancipations (such as women), civil society after the Second World War. However, it is essential that every visitor must find ready to spin a thread through history him- or herself. This works very well with the large number of objects. These come from many European countries. It should be noted that the collection had to start at zero and depends on loans. 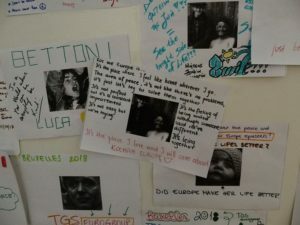 Now, how can the history of Europe be exhibited in a house or museum? The basic problem is no different than other houses of history too. However, these tell usually a ’national‘ story. But, what is a nation today? It is certainly not a homogeneous, let alone ethnic community. So who is the addressee? At HEH, European citizens are the addressees. They come from the 28 EU countries, from other European countries and from outside Europe. European history is something other than ’national‘ history, it is also something other than the addition of ’national histories‘. A house of history is intended primarily for those who come there, who visit the exhibition and engage with the exhibits. What matters is what happens on the spot. Visitors spend a lot of time in the HEH, they often spend a long time in front of individual exhibits and deal with the associated information that can be accessed on the tablet. Striking is the concentration with which many visitors go through the exhibition. In the HEH, apparently, and with much success, much was done for the quality of the museum visit. If you go through the exhibition as a historian, many of the exhibits are crowded with possibilities for deepening, which could be provided on the tablet. Since an exhibition can never be complete and the view of Europe’s history is very different, the tablet could offer insights that pick up on the results of scientific controversy or different interpretations and viewpoints. The permanent exhibition is not on its own. 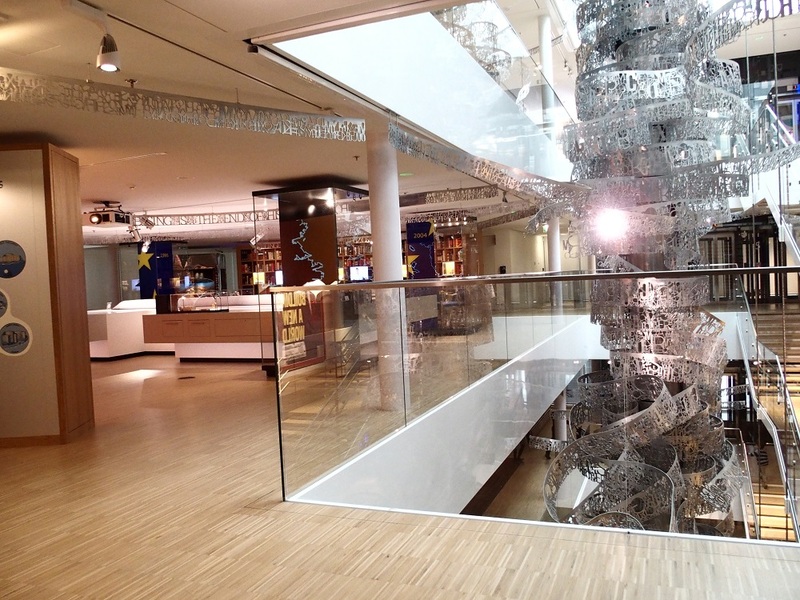 It is supplemented by temporary exhibitions that deal with certain key issues in more detail. There is also an extensive program of events. Therefore, at the end, it should be emphasized that the decisive factor is what happens on the spot and ultimately in the minds of the visitors. Quote this article as following: Wolfgang Schmale, House of European History, Brussels. In: Wolfgang Schmale, Europe Blog “Mein Europa”, https://wolfgangschmale.eu/house-of-european-history-brussels (published 11 March 2018).